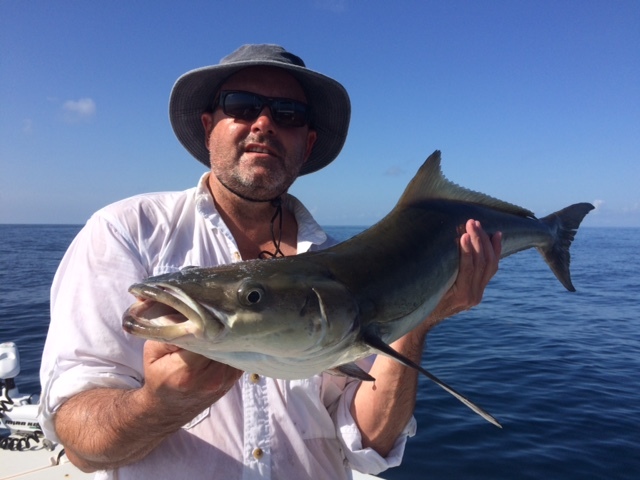 Jacks, Trout, and Snook around Sebastian Inlet. Ken and Irene. Peter and Gary caught lots of Jacks and a nice Trout today on the Attitude Adjustment. 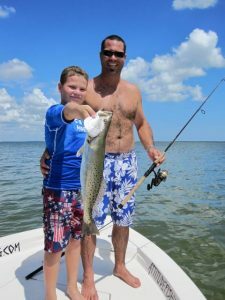 The weather was nice and the tide in the Sebastian Inlet was outgoing most of the morning till about 10:30 a.m. We started off getting pigs and fishing for Snook. We had one hook up but the line broke. The bite was really slow so we moved on. We went and fished around a few of the spoil islands. Peter caught a nice Trout and Gary caught a 10lb. Jack. We also missed a really big Trout that followed a bait to the boat. We went back to the Sebastian Inlet and fished. The Inlet was perfect crystal clear. We made some drifts and Peter and Gary were hooking up with Jacks on every drift. It was a great way to end the day. Thanks Peter and Gary for fishing with attitude. It was a pleasure to meet and fish with you both. Hopefully well do it again in the future. Thursay 5-10-12 and Friday 5-11-12 6 p.m. to 11 p.m. The weather has not been to good lately. The winds are a steady 20kts out of the east. Matt and his father Duck were in town in Orlando together and it was the only two nights that they could fish. Luckily the tides were not to late and we were able to get on some fish. The first night we started off fishing 8:00 p.m. and the tide was still going out. 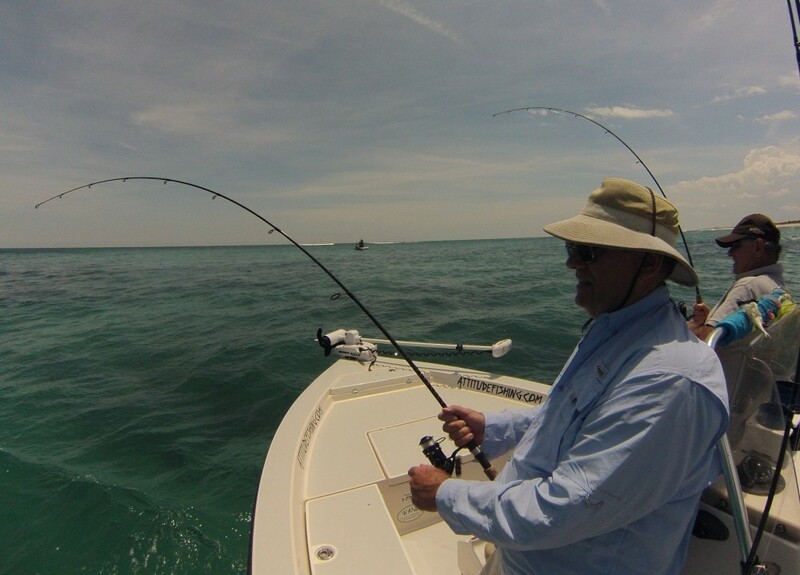 It was not to rough to fish the tip and they were hooking up on every drift. 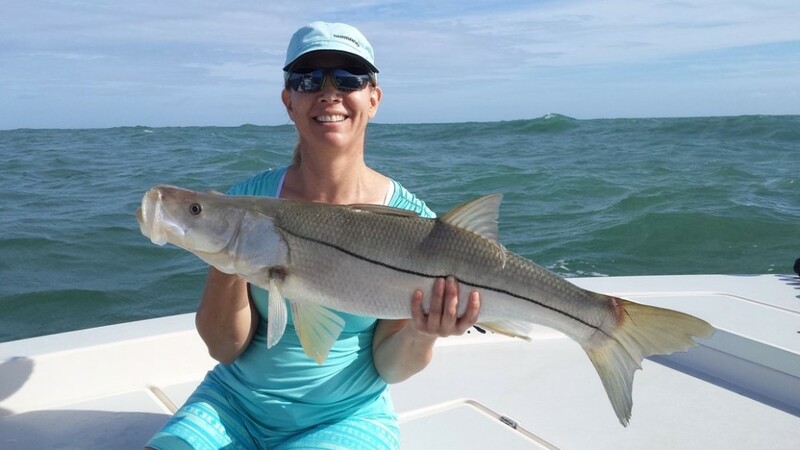 The Snook bite was on! The bite lasted like that until the tide came to a still. around 9:30 p.m. Once the tide switched to incoming the bite never really went off. Duck and Matt caught one more Snook a piece. We decided to call it quits around 11 p.m. They ended the night with one 31″ keeper. The second night the switch of tides was a little later. The winds never stopped blowing and it was quite a bit choppier in the Inlet than the night before. We fished it while the sun was setting, just before dark and I could see enough to keep us out of danger. Duck and Matt were catching Redfish. One of the Reds was probably a keeper but we released. Once it got dark it was unsafe to fish so we moved inside the inlet and fished. It was tough fishing with the winds and the tide. 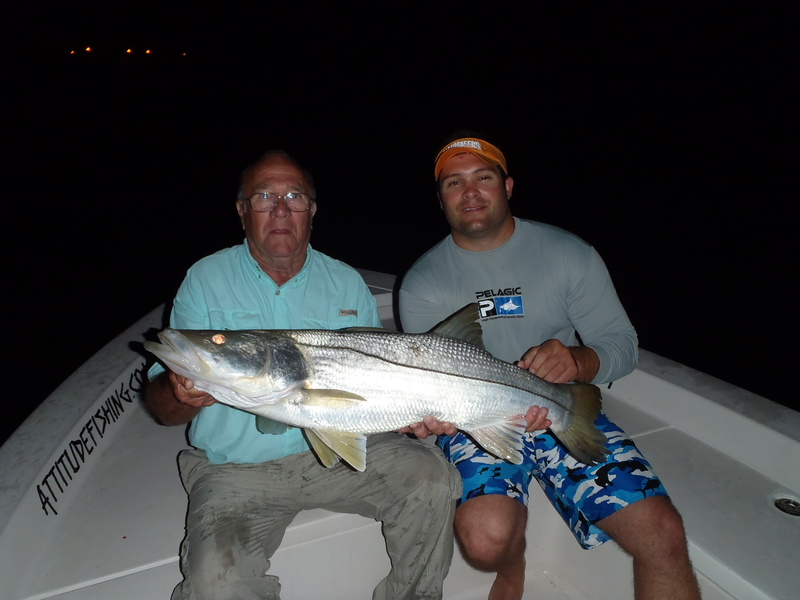 With the bad conditions, Duck managed to catch a big Snook. I think Matt missed one but overall it was tough the fish were not chewing inside. 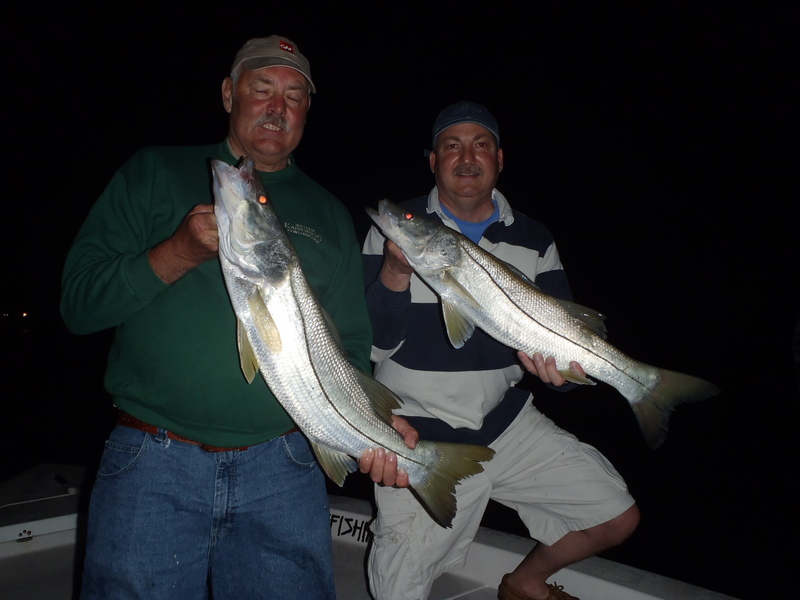 No keepers that night but some early action with the reds and one nice Snook. It was a fun two nights of fishing. Thanks guys for fishing Attitude! Thursday, 4-12-12 6 p.m. to 11 p.m. The winds are out of control. The tide is outgoing most of the night from 5 to 11 p.m. The bait was a little difficult to catch. We finished bait fishing with about 3 dozen baits( pins and pigs). Once it got dark and the Bluefish moved out of there, we were able to get a bait down long enough for a Snook to find it. 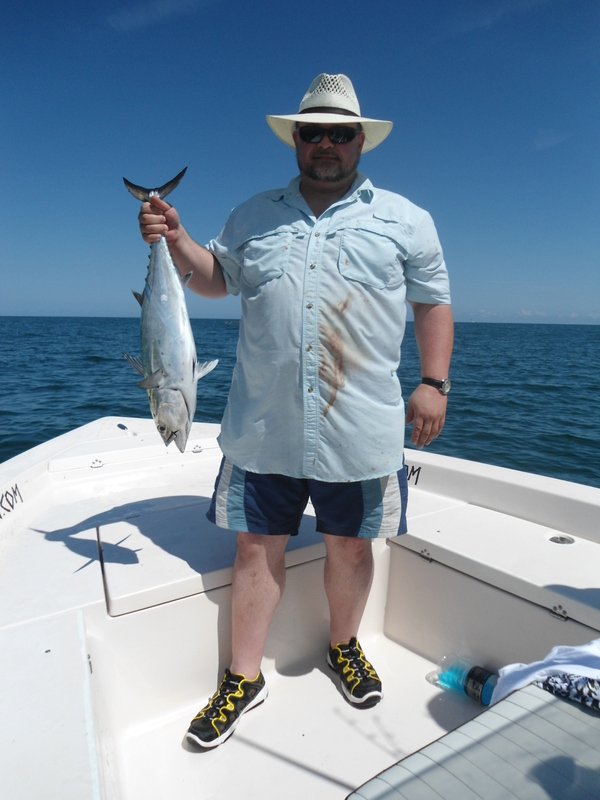 It was a little tricky fishing because of the winds and roughness of the waves. George was first to hook up with a nice big Red. After the first drift, at least one of them were hooking up on every drift. The best was the double up on two keeper Snook. They ended with there 3 keepers and lots of action! Thanks guys for a great night of fishing! Enjoy the fresh fish! Friday, 3-02-12 7 a.m. to 12 p.m.
Thursday, 3-01-12 7 a.m. to 12 p.m.
Friday, 9-30-11 7 a.m. to 1 p.m.
Monday, 9-05-11 8 a.m. to 1 p.m.
Thursday, 8-18-11 7 a.m. to 12 p.m.